Though a pioneer of electrification, the Toyota Prius has had a rough go as of late. With gas cheap and definitely staying that way forever (*wink, wink*) Americans have moved full-force into big SUVs and trucks and away from hybrids and other smaller, more efficient cars. But the updated-for-2019 Prius has a new trick up its sleeve that may help somewhat: all-wheel drive, and done in a clever way. At the LA Auto Show this week, Toyota will unveil the 2019 Prius with an optional system it calls AWD-e. With this, the Prius becomes probably the most efficient AWD car on the market, with an estimated combined 50 mpg. It’s slightly worse off on fuel economy than the standard front-wheel drive Prius, but I drive a 34-year-old BMW that has to be refueled every 30 minutes, so I wouldn’t complain if this were my car. Whoosh! There is goes, blasting through the snow. It is basically a WRX now. Toyota’s designers also appear to have dialed back the current Prius’ super aggro anime cyborg face a bit, though it’s just a bit, and maybe not enough to save it. We’ve heard the looks of the new Prius haven’t helped its sales conundrum here or in other countries, so while it’s hardly beautiful now, this may have been the best they could do with what they had. The rest of the Prius stays the same, with a 1.8-liter four-cylinder gasoline mated to a hybrid electric drive system that puts power to the wheels through a CVT. 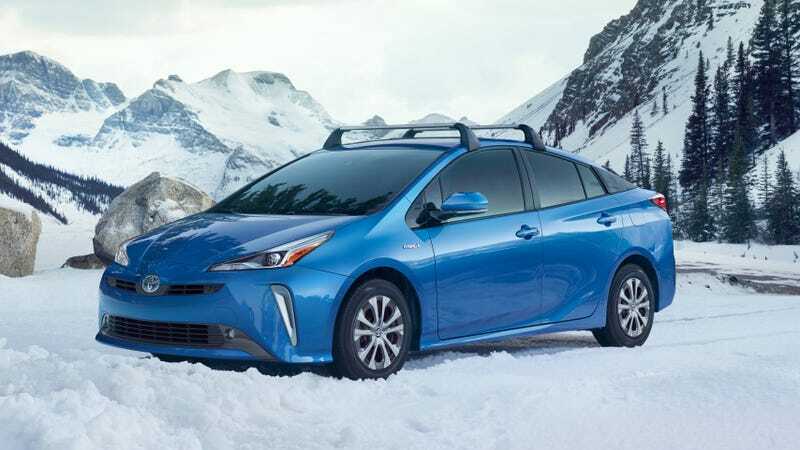 Interestingly the AWD model uses a Nickel-Metal Hydride battery supposedly optimized for cold weather conditions, while the standard FWD Prius uses a Lithium Ion battery. Pricing hasn’t been announced yet, but expect a premium over the FWD model. In any case, if you live in a place with nasty winters and refuse to migrate to a huge SUV like everyone else, this is probably worth a look. A Prius may not be the most exciting car to drive in the world, but it is very good at doing what it’s designed to do.